Everyone loves a bit of drama – magazines and social media sites are plastered with the faces of celebrities; especially when they wish to report on something going wrong in their life- whether it be struggles in their personal relationships, a change of appearance or battling an addiction. For some reason, it’s human nature that we just cannot get enough of some good old goss. On a daily basis, many of us follow trending hashtags on Twitter or check out the latest celebrity news on our feed; so much so that it becomes a bit of an obsession. However, scandals in the celebrity world aren’t a new thing – they’re blown out of proportion to an extent yes, but they’ve always been part and parcel of celebrity culture. Throughout history, there have been hundreds of shocking stories that the media would be clapping their hands to get the chance to publish today. In comparison to the modern media, the privacy of big stars was very much respected, therefore journalists were known to cover up some of the most shocking scandals to ever occur. We’re going to give you a bit of an insight into what really went on behind-the-scenes during the golden age of Hollywood. Lana Turner was considered to be of the most beautiful women in Hollywood during the 1940’s. However, her personal life was far from the glitz and glam of her professional movie career. She had married numerous times during her life and dated some of the movie industry’s biggest stars including Clarke Gable and Frank Sinatra. Lana’s daughter Cheryl Crane was accused of taking the life of her mother’s lover, Johnny Stampanato in 1958. The inquest was accepted that Stompanato had walked into the knife that 14-year-old Cheryl had been holding, during an attempt to defend her mother from physical harm. Turner admitted that before the incident took place, she had been in a dispute with Stompanato, who had threatened to ‘cripple’ her and cause physical harm to Cheryl. Later, the jury stated that Cheryl had acted in self-defence and she was simply charged with ‘justifiable homicide’. While we always envision The Beatles to be untouchable and John Lennon as a music legend, it was reported that his loveable hippy persona wasn’t his true character when within his private life. Many who knew him well reported that he had been both physically and verbally abusive to his wives and Lennon admitted this himself during an interview in 1980. “All that ‘I used to be cruel to my woman, I beat her and kept her apart from the things that she loved’ was me. I used to be cruel to my woman, and physically – any woman. I was a hitter. I couldn’t express myself and I hit. I fought men and I hit women.” he said. “That is why I am always on about peace, you see. It is the most violent people who go for love and peace. Everything’s the opposite. But I sincerely believe in love and peace. It’s unbelievable to think that back in the 1960’s, Marilyn’s alleged affair with the president was kept on the down-low by the US media. The momentous meeting between Marilyn and JFK was when the actress turned up to JFK’s 45th birthday party and performed her iconic rendition of ‘Happy Birthday Mr President’. The pair had reportedly already had a one-night stand beforehand. The media failed to publish reports on the alleged affair as they felt it would have been an extremely disrespectful move to make; which of course, could have tarnished the name of the Kennedy family. 9.1930’s movie star Jean Harlow’s husband committed suicide – or did he? Platinum-haired actress Jean Harlow was one of Hollywood’s biggest stars during the 1930’s. However, after marrying director and screenwriter of MGM, Paul Bern, Jean’s personal life took a dramatic turn when her husband was found dead by Bern’s butler, just two months after they tied the knot. A 38-calibre revolver was found next to his body, and a bullet driven into his skull. Bern had left behind a suicide note which read that shooting himself was “the only way to make good the frightful wrong [he] had done” and to “wipe out [his] abject humiliation”. There have been doubts over the years as to whether he had taken his own life, or if there had been other parties involved. Police had arrived over two hours later to the scene, therefore many presumed that it gave those potentially involved enough time to come up with an alibi. Many who have investigated the case suggested that the movie studios may have had a part to play in writing the suicide note, to prevent Jean’s career being damaged by possible criminal activity. Silent movie star Charlie Chaplin was well into his late 50’s when he dated 17-year-old Oona O’Neill; the daughter of playwright Eugene O’Neill. Chaplin was initially giving Oona acting lessons, but the pair seemed to fall in love. They married on June 16, 1943 in Santa Barbara, California. Chaplin had already been married on three separate occasions, before deciding to tie the knot with the teenager, who turned eighteen just a month before they said ‘I do’. While many were horrified by the relationship, they stayed together until Chaplin passed away on Christmas Day in 1977. If you’ve ever heard of the name Sandra Dee, you’ll most likely associate it within the iconic song Rizzo sings in Grease (1979); in which she compares Sandie’s innocent looks to the famous movie star of the 50’s era. The teenage actress shot to fame when she appeared in the 1959 film, Gidget, which centres around Dee’s character constantly being slammed for her slim frame. Obviously, this wouldn’t even be considered as a central plot for a film today, but back in the 50’s, it was the fashion to showcase womanly curves. As Sandra secured the role, the studio forced her to slim down and watch her eating habits, which led to a lifelong anorexia struggle. Dee passed away in 2005 from kidney disease, which was thought to have been brought on by the eating disorder. Old Hollywood stars were known for being untouchable – they were goddesses on the screen that were both beautiful and admirable. Despite this, everyone knew that Joan Crawford was a hard nut to crack and could have a bit of a temper; especially when it came to her heavily documented rivalry with fellow screen siren, Bette Davis. Joan had been married four times and adopted five children; however, when two of her eldest kids Christopher and Christina became adults, they slammed her for the way she had mistreated them. In an interview with The Guardian, Christina told the newspaper of the moment Crawford had intended to physically hurt her: ‘You never forget that. It was up close and personal. She came this far from my face, and you could see it in her eyes, you can see if someone is trying to kill you.’ she said. After Crawford had passed, Christina wrote an autobiography in 1978, entitled Mommy Dearest, which gave an insight into the emotional and physical trauma she suffered whilst living under her adoptive mother’s roof. ‘People fantasised about who or what I was; that I had this privileged, wealthy, film-star family life. I didn’t have any of that.’ she went on to say. The world was shocked when Jerry-Lee Lewis decided to marry his 13-year-old cousin (Okay, she was his first cousin, twice removed, but still!) in 1957. Again, the media covered the scandal and claimed that Myra Gale Brown was in fact, fifteen; two years older than her actual age at the time they had wed. During the early stages of the marriage, their relationship had been kept completely under wraps until a British journalist discovered the secret and published the story worldwide. Entwistle had appeared in a number of film roles as an extra, but failed to make a huge name for herself in the film industry. Believing there was nothing left for her, she climbed to the top of the ‘H’ in the Hollywood sign and leapt to her death. 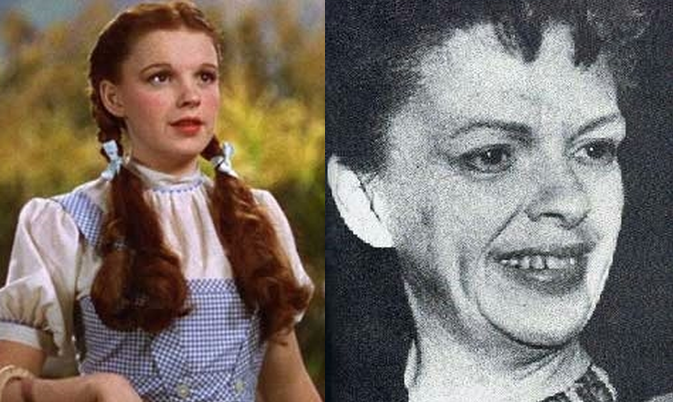 Judy Garland, best-known for playing the role of ‘Dorothy’ in the Wizard of Oz’ (1939) had been involved in one of the Hollywood industry’s biggest secrets. Behind the magic of those iconic films we have all come to love, the bosses of movie studios controlled young child actors to create their own vision of what the perfect Hollywood star should be. Studio bosses branded Judy as the ‘ugly duckling’ and from the young age of thirteen, forced her to undergo cosmetic procedures to change her appearance and fed her sleeping pills to keep up her stamina throughout a gruelling filming schedule. Throughout her life, Judy faced severe depression due to what she had been involved with and suffered numerous nervous breakdowns, attempted to commit suicide on more than one occasion and became addicted to pills. She continued to perform throughout her life until her body practically gave up. She passed away at the age of 47. Judy aimed to write a full memoir of her experiences, with the intention of slamming the MGM studio system for the way they had mistreated her, but only managed to write 65 pages before she passed. Eddie Fisher was one of the most popular US singers of the 1950s. Teenagers worldwide were head-over-heels not only for his outstanding talent but his dreamy looks too, of course. When Eddie married the wholesome American sweetheart and film actress, Debbie Reynolds; the pair became one of the most adored celebrity couples of the era. However, the fairytale romance wasn’t to last. The US public was left outraged when it was reported that Fisher was set to divorce Reynolds after he had been having a secret affair with the actress, Elizabeth Taylor. What made the whole deal even more shocking was that Elizabeth and Debbie were the best of friends; having grown up working together in the film studios. Elizabeth didn’t hang on to Eddie for too long though – she soon dumped him for her true love, Richard Burton. Believe it or not, Debbie and Elizabeth became close friends again in later years. As we’ve already stated, John Lennon wasn’t the nicest of guys in real life – sorry to break your heart if you’ve always been a fan. As well as beating his wives, he was also known to be quite controversial in his public remarks. While many let the comment go over their heads initially, newspapers in the US grabbed the story and pretty much ran with it. As you can imagine, strong believers in the Christian faith were absolutely horrified.